Nawal Aït-Hocine is an independent compliance, sustainability and legal professional with 20 years’ experience in executive positions, managing and protecting corporate risk and reputation while shaping industry best practice in several sectors.In her current work, Nawal is driving sustainability and compliance projects to embed triple bottom line strategies. This includes the design of several sustainability, risk management and compliance strategies (including policies and procedures, communication and training), as well as of due diligence programmes, running investigations and coordinating certification audits. She also advises clients on the implementation of the new ISO 37001 antibribery management systems standard (from initial assessment to certification). In her previous activity as Corporate Responsibility Director at Cartier, the luxury goods company, she shaped company strategy and policies around responsible sourcing, supply chain, environmental footprint of manufacturing and retail activities as well as product eco-design including furniture, packaging and visual merchandising and she promoted industry best practice throughout the precious metals, diamond and gemstones industry from mining to retail as a member of the Board and of the Executive Committee of the Responsible Jewellery Council (RJC) and of the Jewelers of America’s Ethical Initiative Committee. 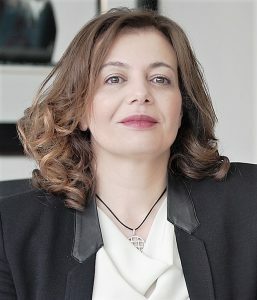 Prior to that, as Head of Legal and Compliance and Company secretary at Metalor, a leader in the international field of precious metals and advanced materials, she designed and implemented the company’s comprehensive compliance strategy including in the areas of anti-money laundering, bribery and corruption. She has also been Head of Compliance Europe Middle East and Africa at Reuters, the international news agency, and Senior Legal Counsel at SGS, the Swiss based inspection, verification, testing and certification company. In her various positions Nawal has consistently shaped policies and industry best practices around compliance, human rights, anti-money laundering and fighting bribery & corruption. She has been actively involved in various industry organisations and working groups including the Responsible Jewellery Council, the Swiss Better Gold Association, the Sustainable Luxury Working Group, the REACH Legal Working Group, the International Chamber of Commerce (ICC) and the International Federation of Inspection Agencies (IFIA) and she has built collaborative cross-sectoral strategic relationships with several United Nations Agencies, Non-Governmental Organisations and other key constituency groups. Dr. Aït-Hocine holds Masters of Science in International Law and Business Economics and a Doctorate in Law from the University of Nice Sophia Antipolis in France. She speaks and works in French, English, Arabic and Spanish.